Ellen Julia (Nellie) Gould was a nurse at Royal Prince Alfred Hospital, Sydney, and was a pioneer in the training and education of civilian nurses for military service during the Boer war and later in World War I.
Lucy Osburn resigned from Sydney Hospital in 1884 and had been replaced by one of her own protégés Matron McKay. Following Ms Mackay’s resignation in 1891 Nellie Gould was appointed the third matron of the prestigious Sydney Hospital (1891-98). 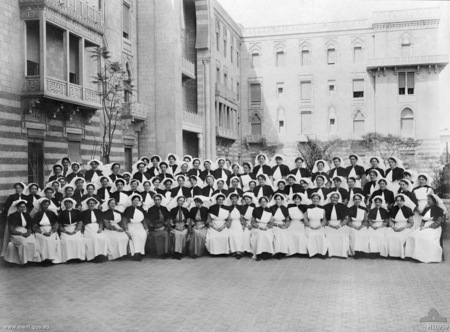 Nellie Gould, Jane Bell, Rose Creal, Maud Kellett and a number of other distinguished Australian Army Nursing Service (AANS) leaders were founding members of Australian Trained Nurses Assocation in 1899, which would in later years become the Australian Nursing Federation and form the foundations of modern nursing regulation. By far her most meritorious contribution began when she was asked in February 1899 to help form the Army Nursing Service, and become one of Australia's fisrt Boer war Nurses. In May of the same year the first 26 official military nurses were sworn in, hand picked by Nellie Gould herself. Miss Gould had chosen her nurses only from those who had had more than seven years of nursing experience. In January 1900 Nellie Gould, Lady Superintendent of Nurses, sailed on the Morovian, with her second in charge, Julia Bligh Johnston and twelve other members of the NSWANSR with the second contingent of the New South Wales Army Medical Corps (no nurses sailed with the first). 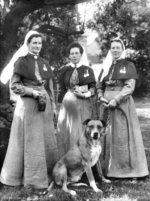 Miss Gould and her Australian Boer war Nurses worked along side the 1,300-1,400 strong contingent of female British nurses attached to British hospitals. It appears that during the early stages of the Boer War Nellie Gould was serving at a Stationary Hospital (SH) in Sterkstroom near Stromberg where in three months they buried 60 Australian soldiers. 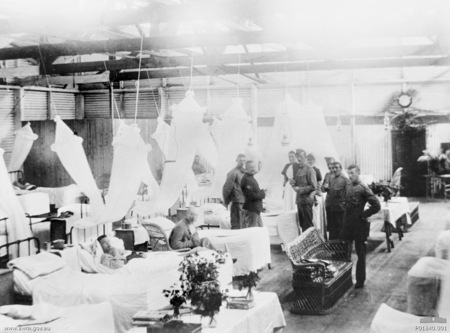 In another post, disease was rife and in a matter of a few weeks over 1000 men had died from disease alone. 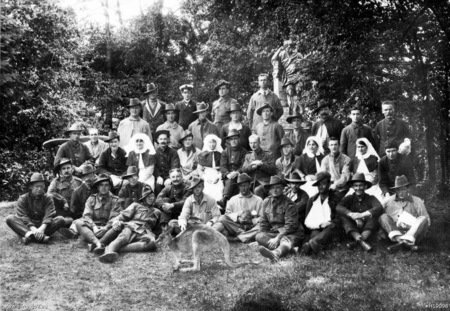 The Australian Boer war Nurses were said to be seen scrubbing and cleaning sick tents and using their own clothing as blankets for the sick, a testament to their great committment! Nellie Gould…... again When War broke out in 1911 their experience as Army nurses in the Boer war gave Matron Nellie Gould and Sister Julia Bligh Johnston invaluable knowledge and understanding to be able to lead Australia’s first contingent of nurses bound for Europe in World War I. They boarded the Euripides as part of the first Australian Imperial Force (AIF) contingent but what they were about to encounter no previous experience could have prepared them for. 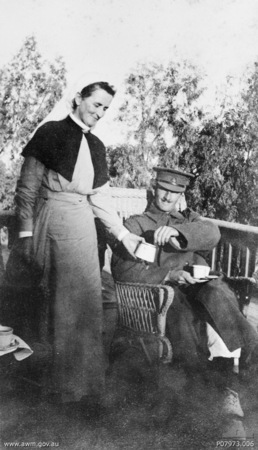 Nellie Gould was asked to commission 2 Australian General Hospital (2AGH) in Cairo. She took charge over the ninety-six Australian nurses on 20 January 1915 and within twenty four hours Nellie Gould and her nurses had to prepare the hospital for the influx of casualties which followed the first landing in Gallipoli. One of her nurses recorded that they admitted over 100 wounded soldiers that first day. At the time of her service in World War 1 Nellie Gould was in her fifties and in 1918, aged fifty-seven years, was appointed matron of 1 Australian Auxiliary Hospital (AAH), a convalescent hospital of 500 beds at Harefield, England where Australian casualties of the Somme were convalesced before being transported home. Her final posting before returning to Australia in October 1918 was at Cobham Hall which was an Officers' Hospital. During her voyage home the Armistice was declared on 11 November 1918 and on arrival home to Australia, by this stage her health poor, Nellie Gould was unfit to take up nursing duties again. Her AANS uniform was weighed down with medals and she was awarded the Royal Red Cross (1st class) a medal which is conferred upon members of the nursing services, irrespective of rank, who are 'recommended for special devotion and competency in their nursing duties' in 1916. A group photo from Harefield -note the Kangaroo nicknamed Jimony!